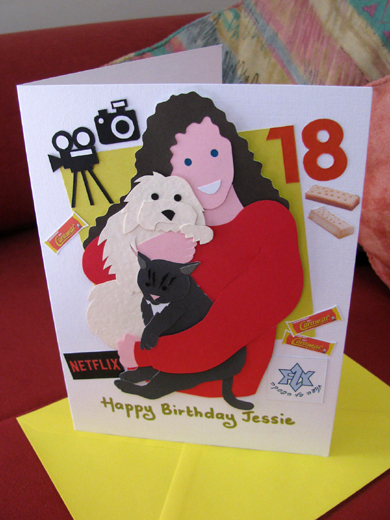 Jessie's mum asked me to make a special card for her daughter’s 18th birthday back in June. "She loves our puppy and cat" mum told me. She also said that Jessie hasn't eaten chocolate for years, but has found the caramel-flavoured bar Caramac a good substitute. She rather likes shortbread biscuits as well. She is very into photography and film making. Jessie is also involved in FZY (the Federation of Zionist Youth), Britain's oldest Jewish, Zionist, pluralist youth movement. She enjoys the media services provider Netflix. I added a paper portrait of Jessie to the list and a big number 18 to mark her age too! Jessie's mum was delighted to receive her daughter's birthday card. "The card arrived - it’s amazing, I love it. Thank you so much." she wrote to me. "You captured her perfectly." 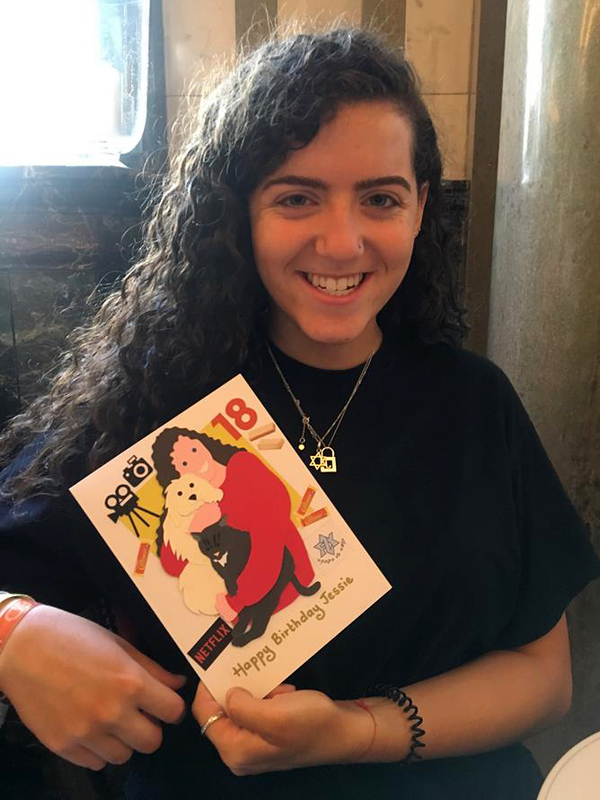 Then, on Jessie's birthday, she sent me this super photo of the birthday girl, above, and told me that "Jessie absolutely loves her card." Shiri was turning 16. Her mum asked me to create a Hebrew card for her (the card opens in the Hebrew direction, from the right, because the Hebrew language is read from right to left instead of left to right like English) but wanted it to say "Sweet 16" somewhere on the card. She also asked me to show Shiri with her long dark hair and many ear piercings. I cut out the word "Sweet" in pink letters and added a big bold number 16, along with some hearts and flowers. Grandma asked me for a card as well, below. To make them different, I placed the number 16 in the centre of the card and added some bunting, balloons and flowers. Bunting is perfect for any happy occasion! * This post has been shared on Wednesday around the World, Wordless Wednesday, Little Things Thursday, Creatively Crafty, The Creative Circle and Share Your Cup Thursday. I always marvel at your creativity! Wow! Wonderful! You are so talented. The puppy is so cute! I think you nailed it! Great job! Her smile says it all! I love all of the dimension. Thanks for sharing with SYC. Such cute cards! I love the detail of them.